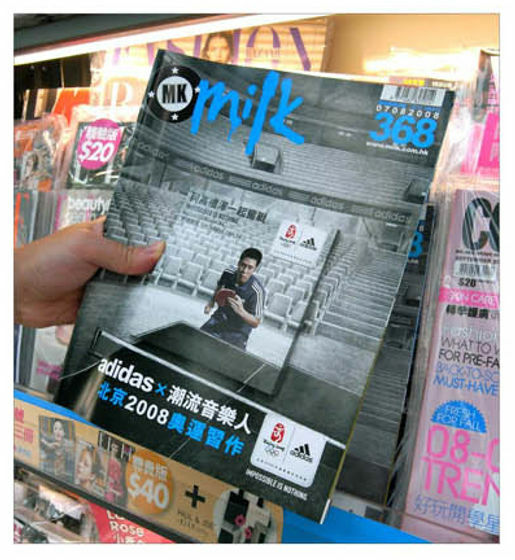 Adidas was an Official Partner of the 2008 Beijing Olympics and their brand positioning was – ‘When 1.3 billion people get behind their athletes Impossible is Nothing.’ TBWA\TEQUILA Hong Kong was briefed to create an original print campaign to extend the adidas China Olympic corporate campaign; one that would specifically reflect and support local Hong Kong athletes. They came up with a flip book featuring Ko Lai Chak and Li Ching, table tennis champions. Hong Kong’s greatest hope in the Olympics was table tennis duo Ko Lai Chak and Li Ching, who won silver at the Athens Olympics. Through the Adidas site TBWA\Tequila invited members of the public to be photographed in table tennis poses like their heroes. All the best poses were mounted on a flip book against a stadium, then published in youth magazine Milk. The Olympics book was developed at TBWA\TEQUILA\ Hong Kong by creative directors Mark Ringer, creative director/art director Joseph Mok, creative director/copywriter Law Chi Hang, art directors Ronald Tin, Cheung Pui Kwan and Thomas Wong, copywriter Calvin Chow.